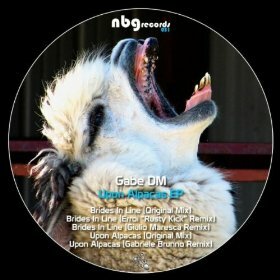 Upon Alpacas ep out for NGB records: techno and fun or techno and fail? The 4th of July my new Ep called Upon Alpacas has got released for NGB records. The ep contains two original tracks: Upon Alpacas and Brides in Line, both are slightly different from my other past releases. I wasn’t very sure of the sound of the tracks so I had to remix them several times in cooperation with Sebastian Fischbeck my dear friends and mastering technician at Arktis Mastering Studio. At the end I was partially satisfied with the result also because I feel my mixing technique is slowly getting better but still not quite good so the tracks didn’t sound to me as I wish. But they passed the check with the label and the ep was scheduled to be released. The fact that the ep contained three good remixes actually relief my fear a bit. Cheers all, and have a uber summer, mine is already started and I am doing lots of windsurf with my baby on the shores of Lago di Bracciano. Yeah!